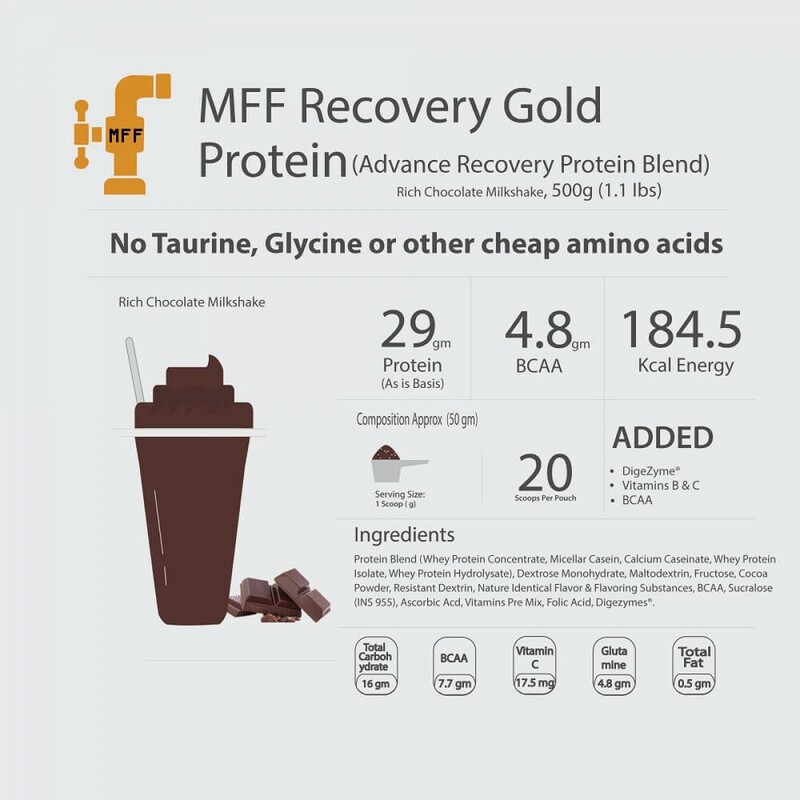 MFF™ Recovery Gold Protein is a premium gold standard protein which provides advance recovery for your workout. The research behind this product was done with a question to determine how the recovery can be fast and provides more stable results to your body. We did deep internal research to find what could be the advance mechanisms to develop overall body and muscle recovery supplement that increases the overall post workout recovery which is not just beneficial for muscle but even different functions that run simultaneously in our body. The stress that is created on our body during the workout, it breaks our muscle tissue making them weak and requires repair at a different speed. Glycogen level reduces making us feel tired and low in energy, and many vitamins and minerals are lost or their requirement increases to provide better oxidation, stronger immunity and increase overall energy production. There are many such small functions played by vitamins and minerals which when combined can affect the overall post workout recovery of our body. 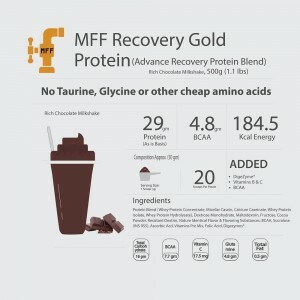 MFF™ Recovery Gold Protein shake is an Advance post workout muscle recovery protein supplement with gold standard protein recovery results. After research, it is designed with unique ratio of different premium ingredients which are combined to provide faster and better results which not just helps you to recover better but even get much stronger. BEST MUSCLE RECOVERY – Advance 5 Protein Source Combinations For Faster and Sustained Recovery. Protein is basic fuel for muscles and our muscle tissue breaks and becomes weaker as we put any kind of stress through workout or physical activity. So they required right protein fuel during right time. Muscle recovery has different stages, once you require faster protein release muscle recovery then you require sustainer protein release for continuous muscle recovery. For faster protein release there is more amount of added premium Hydrolyzed Whey Protein (Pre-digested Protein), Whey Protein Isolate and Whey protein concentrate. Combination of these proteins as muscle recovery protein supplement helps your muscle to get quick protein release for your muscle helping in faster repair of broken muscle tissues post any workout sessions. As time goes after workout your muscle requires continuous repair to get stronger. A continuous supply of Premium Micellar Casein and Calcium Caseinate protein for up to 6-8 hours helps your muscle to get continuous fuel which makes you stronger for next workout session or increases overall strength through better muscle recovery. MFF™ Recovery Gold Protein powder as best post workout recovery drink provides quick glycogen recovery which is a high source of energy. Low glycogen level occurs due to energy being consumed as the workout strength required for making physical movements or lifting weights. This advance post workout recovery protein drink helps in glycogen level replenishment helping you to feel more energetic and active even after intense or long workout or any other physical activity sessions. As the best post workout muscle protein recovery drink supplement, in MFF™ Recovery Gold Standard Protein powder there are advance ratios of different vitamins and minerals added which enhances your overall recovery and makes your body stronger. As the physical workout increases the requirement of vitamins and minerals in our body increases. Not completing them can affect in different ways. It could affect our immunity, the capability to generate energy, transfer oxygen to our body tissues and many more such roles which helps our body to function in much better ways. So Advance Vitamins and Minerals in this post workout muscle protein recovery drink supplement helps in better post workout recovery by recovering from the damages or increased needs. It helps us to achieve better fitness and sports goals. - Maintains Strong Immunity:- It helps to maintain strong immunity by producing the antibodies which are required to protect our body from infections which are most susceptible to post workout. - Formation of Hemoglobin:- It helps in iron absorption which is important for the formation of hemoglobin. Hemoglobin helps to carry oxygen to our muscle. - Works as Antioxidant: Antioxidants helps in the protection of inactivation of oxidants which are produced post workout. They also help in injuries and damages protection of our muscle tissues. BCAA is a combination of Leucine, Iso-leucine, and Valine which are essential amino acids. It is also known as Branched Chain Amino Acids. BCAA plays an important role in increasing protein synthesis which helps in overall muscle growth and in making this product one of the best post workout recovery supplement drink. BCAA helps in lean muscle mass and strength improvement by maintaining the neuromuscular adaption. It also helps to decrease the muscle loss by protecting the muscle tissues damage during long and intense workout session. Glutamine is an important amino acid which is required for better recovery in post workout recovery protein shake powder. Not only it increases overall protein synthesis but also reduces muscle breakdown and helps in quick repair of broken muscle tissues. 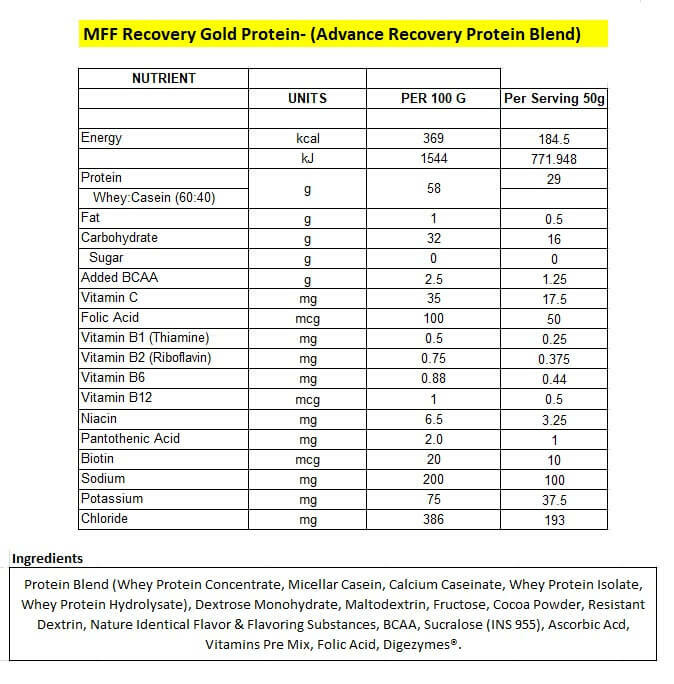 MFF™ Recovery Gold Protein is made as advance post workout muscle protein recovery drink supplement by additionally adding DigeZymes®. DigeZymes® is a combination of Amylase, cellulase, lactase, protease, and Lipase. This combination of advance enzymes blend helps in faster protein and carbohydrate digestions and absorption for the faster recovery. We at MyFitFuel are committed to bringing best products in your hands. In MFF™ Essential Recovery Protein there is no Skim Milk Protein powder or Soy protein added. We only use premium protein source in MFF™ Essential Recovery Protein shake powder. What makes MyFitFuel Provide Best Post workout Recovery supplement drink in India? 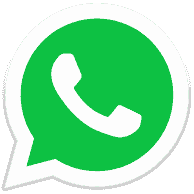 a) Quality:- Quality have always been our biggest priority. We at MyFitFuel never compromise in product quality of any of our products and we keep innovating to help you achieve your sports and fitness goals. b) Consistency:- Quality Consistency in MyFitFuel Post workout Recovery drink is very important for us. From the beginning of the process before procurement of ingredients to the final supply of finished product, we take different many measures to provide you with the same best nutrition quality every single time. Consistency and Quality make this product best post workout recovery supplement drink in India. Pour 250 ml of water in a good blender/shaker like MFF™ Blender and add 2 Heaping scoops of MFF™ Recovery Gold Protein. Shake it for 15-25 seconds and consume immediately. We recommend 1 serving (2 Scoops) daily post workout but if looking to take additional protein intake for the day then you can take it any other time during the day. Benefits of taking with Water- Taking MFF™ Recovery Gold Protein with water helps you to get faster recovery and also helps to get Lean Muscles Mass. Benefits of taking with toned or double toned milk- Adding milk with MFF™ Recovery Gold Protein helps to make the shake creamier and thicker. But adding 250 ml of toned milk will also add almost 150 extra calories and more protein from milk in every shake. So, if you are looking to recover and bulk up to increase weight then taking this best post workout recovery supplement drink with milk will always be recommended. Adding milk might make the recovery protein very thick which will take longer to mix. INGREDIENTS : Protein Blend (Whey Protein Concentrate, Micellar Casein, Calcium Caseinate, Whey Protein Isolate, Whey Protein Hydrolysate), Dextrose Monohydrate, Maltodextrin, Fructose, Cocoa Powder, Resistant Dextrin, Nature Identical Flavor & Flavoring Substances, BCAA, Sucralose (INS 955), Ascorbic Acd, Vitamins Pre Mix, Folic Acid, Digezymes®. i ordered in evening and i got this delivery next afternoon. very nice. product taste good and i used once and after workout i could feel more recovered.